Are we annoyed with Mouth Money yet? Only about one week left! I have signed up for another 30-day challenge! I will not necessarily post meal blogs to Facebook or Twitter beyond Mouth Money V.1 (unless my mother and the Kardashians find that state of affairs unbearable). This challenge is of the organized kind, set in motion by Crossfit Center City. The twist here is a sweet little honey-pot to be won by the person with the greatest changes in body composition. I've enjoyed this 30 days so much and didn't plan on stopping – so why not sweeten the challenge with a few dollars? Even some embarrassing before-and-after pics won't stand in my way! Breakfast: If there's one thing I've become attuned with during my Paleo experience, it's the food needs of my body. Some days I need a good post-workout meal; others days I'm fine going without. Some mornings I want a big breakfast, others a light snack. When I woke up this morning I felt fat-and-carby. Protein wasn't on my radar. 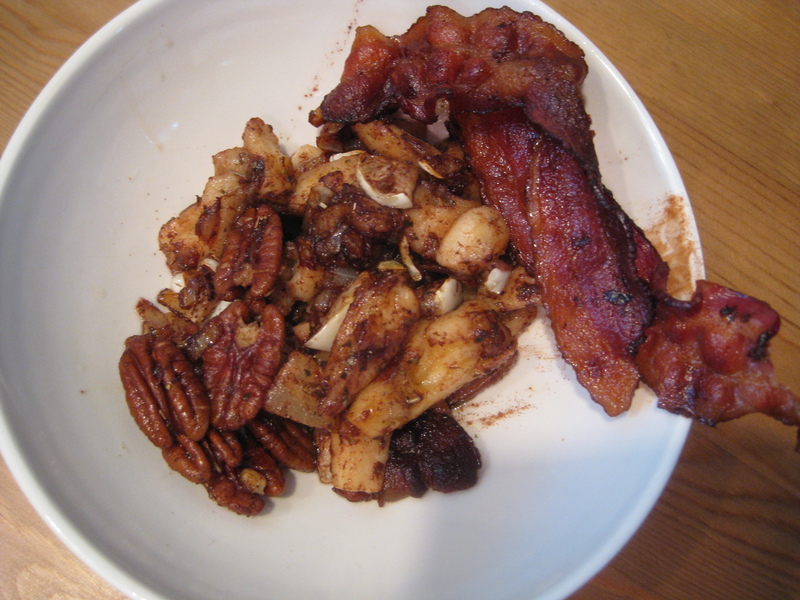 I went for a Bacon, Apple & Pecan breakfast with Sage & Cinnamon. 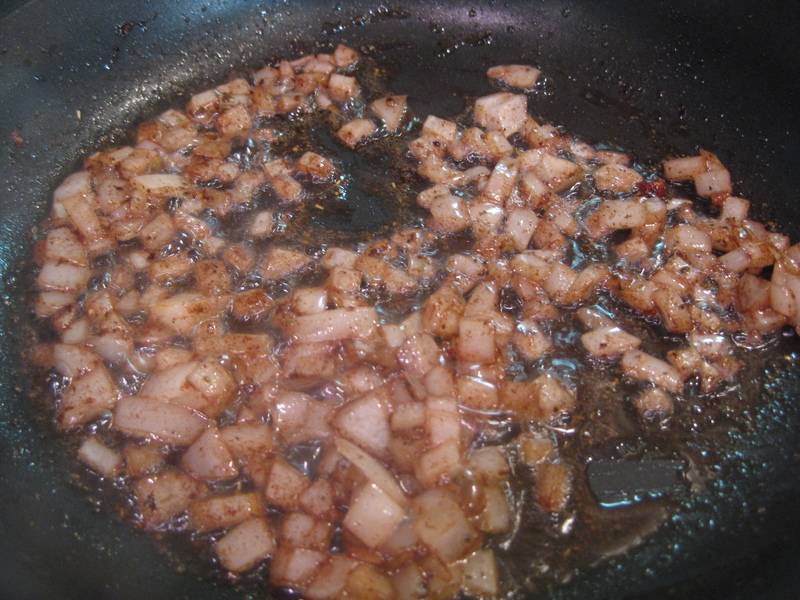 After frying up some bacon I used the bacon fat to saute some chopped onion. I added some rubbed sage and cinnamon to the skillet and allowed the flavors to meld. Five minutes was enough to really soften the onion and meld the flavors. Next I added chopped apple and pecans with a bit more cinnamon. I cooked the whole mess until the apple was soft and enjoyed a yummy and satiating fat-filled breakfast. A little odd, but definitely what I was in the mood for. Bacon, apples and pecans with sage & cinnamon. 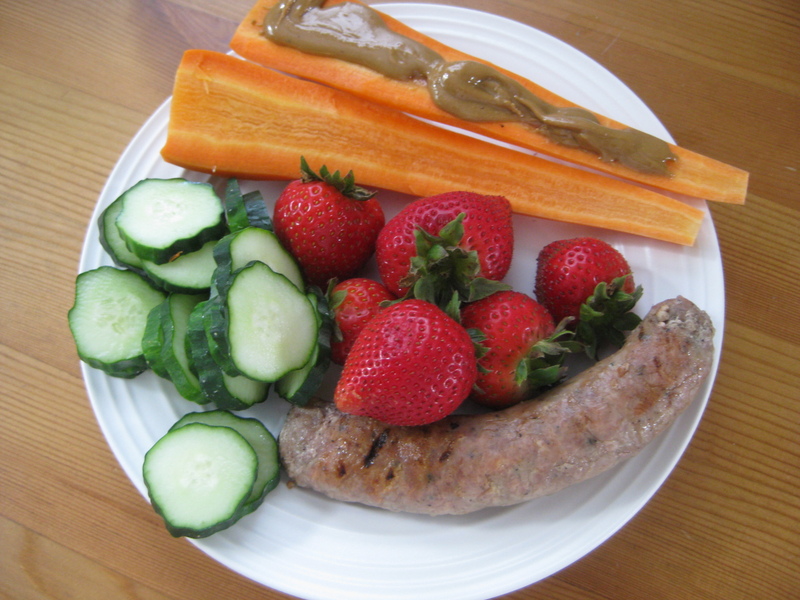 Lunch: Leftover sausage, cucumber & carrot from the farm market (topped with Sunbutter, of course) and strawberries. So colorful. Like a Food Pride parade. 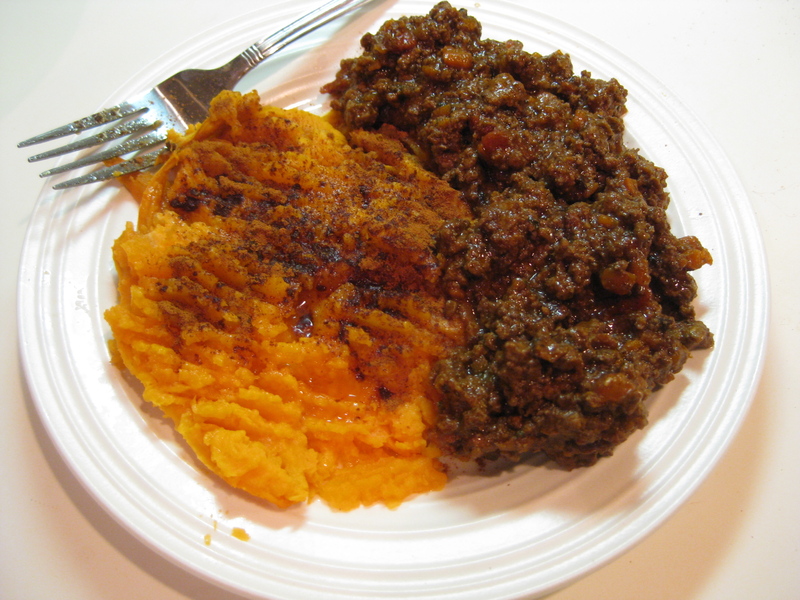 Dinner: Some freshly-made Bison Chili with sweet potato. I love sweet potatoes. I buy the more petite spuds and they travel perfectly to work – just stab a few holes through them and pop into the microwave, cooking about 2 minutes before flipping over and cooking 2 more. You don't even need a freakin' lunch bag. Just shove it in your purse or your back pocket and head out the door. Sweet potato goes with everything. Even that houndstooth scrunchie you can't match with anything in your closet. Today's Workout: Filthy Fifty. Or, in my case, Dirty Thirty. Twice this month I've been on the verge of the Mid-Workout Yak. Your obsession with sausage mystifies me. Do you know what’s in it? Or what the casing is made of? Please declaim. Having spoken to the farmer I’m very confident in the source of my pork – to say nothing of how delicious it is! Pasturing pork and supplementing with whey is a top-knotch feeding regimen. The ingredients are pork, paprika, and a few other spices depending on whether it’s breakfast sausage or italian. Nothing unnatural and the raising, feeding, slaughtering and processing is done at the farm, which I visit often. The pork can be purchased without casing; but when we are in a “casing situation” we peel it off before cooking. I can bear it. Your pictures are fabulous. Glad you are going to continue! I enjoy your blog. I just made the spaghetti squash and meatballs recipe 2 nights ago and it was so good.